Have you heard about Klout? Klout is a free service that lets you measure your influence on Twitter, Facebook and LinkedIn. They monitor the content you generate, how others respond to that content while tracking the size, makeup and influence of your followers. They look to see if people retweet or respond to your Tweets (and if you respond back). They measure the amount of ‘likes’, shares and comments you receive. And they measure the quality as well as the quantity of your connections. When Klout came online in September of 2009 they only took Twitter into account and I dismissed them as a one-trick pony in a social media space that’s full of them. Judging by my score as well as scores of my friends, the numbers didn’t seem to be accurate. However, Klout has made a lot of changes. While I think there are still flaws in the system, they’ve made a lot of headway. Since their launch, they’ve added Facebook and earlier this month began working with LinkedIn. Getting your Klout score is as simple as logging in to their website via your Twitter or Facebook account. You’ll see your overall Klout score as well as some secondary scores. So what do those numbers mean? The overall score, along with Network Influence and Amplification Probability range from 0 to 100. Klout looks to see if people retweet you, reply to you, comment, click on links you post and more. Your score will change over time and using the charts, you can actually see how your score in each category changes from day to day. This is really useful as you can see the impact of spending time tweeting, retweeting, responding to others and so on and use that to improve your social media strategy. I haven’t connected LinkedIn to Klout yet so those metrics aren’t shown in my score. What Klout uses to determine your network influence is checking to see how influential are they people you influence, taking into consideration, among other things, the Klout score of those you interact with in social media. The next score you’ll see on Klout is your Amplification Probability, which essentially measures the likelihood your updates will be shared, retweeted, liked and commented on. My Amplification Probability Score on this date is 40. Beside the chart, you can see the total number of Retweets, Likes & Comments I’ve had all-time on Twitter and Facebook. The final piece of the puzzle regarding your score is True Reach. This number primarily there to filter out the number of fake as well as inactive Twitter accounts. 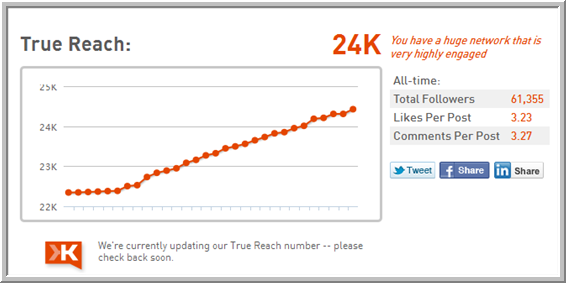 According to Klout, even though I have 61,000 followers on Twitter, my true reach is 24,000. I doubt the number is that high but, as you can see in the above graphic, Klout says “We’re currently updating our TrueReach number — please check back soon.” So the 24k number is probably inaccurate and Klout has been displaying that same update message for a few weeks. In addition to your score, Klout has added some new features that give you details such as Topics. 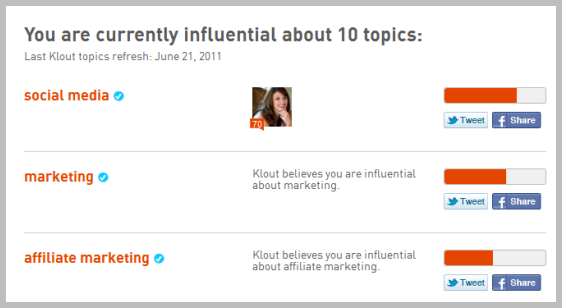 What you find on your topics page are the topics Klout identifies you as being influential about. Note the orange bars in the above image. These illustrate the amount of influence you have for each topic. Since I’m a marketing and social media consultant, it’s no surprise that I score high on those topics. I also sometimes comment on affiliate marketing which shows up here at #3 but notice the orange bar is lower than for social media and marketing. Further down the list, topics like Amazon, Apple and cars show up on my list, all topics that I sometimes tweet about but aren’t really part of my business. Another page on Klout is called Influencers. This page shows the overall Klout scores of those you influence as well as their topics of influence and what Klout calls their Klout Style. Also on this page is a list of Twitter users that Klout feels influences you. Did they leave someone out? No problem because Klout gives you the option of adding anyone by entering their Twitter username. That probably won’t affect your score but I’ll be it influences the person you add’s score. 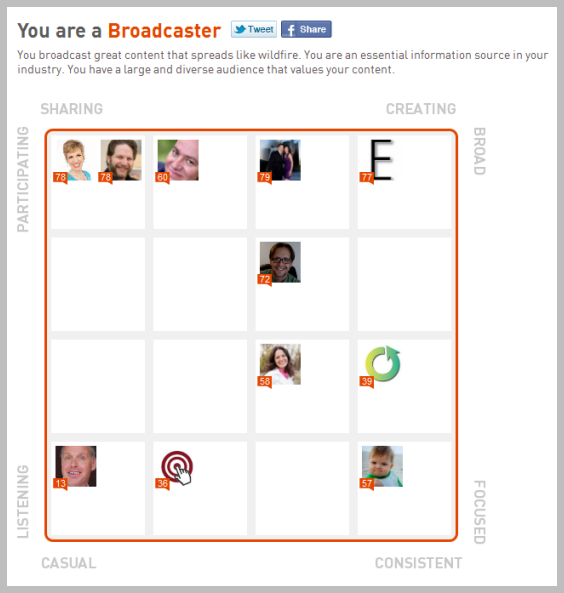 Your Style on Klout is an assessment of your personality or social media style. Klout determines this based on your output as well as the response to it. Your style is adjusted automatically as Klout spots changes. There are a variety of styles including Curator, Broadcaster, Taste Maker, Celebrity, Syndicator, Feeder, Thought Leader, Pundit, Dabbler, Conversationalist, Socializer, Networker, Observer, Explorer, Activist and Specialist. To get started, head to Klout.com and follow the instructions. It’s a free service. Your Klout score will change regularly and if you utilize the daily charts, you can test different strategies to improve your Klout score. Any widely accepted platform that measures the ROI on social media is going to be extremely useful. So is the ability to find and connect with the influencers in a particular niche. Klout is teaming up with other companies to offer brands the ability to find and interact with their biggest fans. That’s something that’s difficult to do when you have tens of thousands of fans or followers in social media. Have you checked your Klout score? Have you used it for a client? Please share your experience below by leaving a comment. If it’s your first time to leave a comment on this blog, your comment will be held in moderation until I can review it. After your first comment is approved, your future posts will show up immediately. So join the conversation. Thanks for the comment, Nate. You hit the nail on the head. Now I know what’s Klout all about. Just signed up and check my own stat. 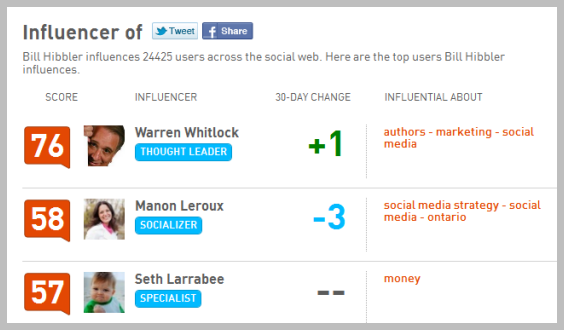 We can even compare our Klout stat with our friends (or competitors :p). This is the tool that I have been looking for! Thank you so much for the post, Bill. Glad that I found it after Googling. Thanks for your comment. Yes, you can compare scores with friends and competitors as well as help improve the Klout of those that influence you. Thanks for the info! I’ve saved this primer for my clients who don’t quite understand the whole social influence thing. How have your uninitiated clients reacted to Klout thus far? It has its flaws but I like that Klout is improving. It can’t demonstrate everything I do for a client but it is a way to measure certain elements like comments per post, likes, retweets, unique commenters and retweeters, etc. Thank you Bill, yes this was very helpful! All meat and no fluff. Awesome. Great overview on Klout. I would be lying if I said I didn’t check out my Klout score once a week, although I don’t take the score too seriously because I apply a variety of other metrics to measure my performance. The “My Klout Style” indicator is one of my favourites…which ironically is in line with my personality style.. networker/ thought leader… funny that. Thanks for the post. Thanks for the comment, Julia!